Hi everyone from the hearings on the confirmation of Neil Gorsuch to the Supreme Court. We're here in the Hart Senate Office Building. The hearing is scheduled to start in 13 minutes. Judge Gorsuch arrived around 10 minutes ago, and is in the back -- not yet in the hearing room. Senators and their staffs are starting to gather in the room. Roughly half of the press seats are full. There ate roughly 60 seats available for members of the public. Most are occupied by people with red shirts with the hashtag #StopGorsuch. Photographers flank the hearing room waiting for Gorsuch to walk in. The "energy" in the room is relatively easy, not tense -- there isn't the air of a looming confrontation. Is this hearing view-able online for free? Chairman Grassley and Senator Leahy are now here. Who scheduled Comey's and Gorsuch's hearing at the same time? We should all take guesses at the number of interruptions from the gallery during the hearing. I'll say 5. Awesome to have Tom doing this blog, his insights are invaluable. A helpful reader has provided a link to the C-SPAN feed in the comments below. The room is structured in basically six parts. Up front are the Senators, backed by their staff. Then there is the witness table, which today and tomorrow will have Judge Gorsuch. Then there is a section for guests. Then press. Then the public. And on the side are photographers. The room has gotten quiet, and everyone is being directed to take a seat. It looks like they are going to try and start on time. Photographers remain at the front of the room, waiting presumably for Gorsuch to enter. Today will just be statements from the Senators. We probably will finish around 3-4p. 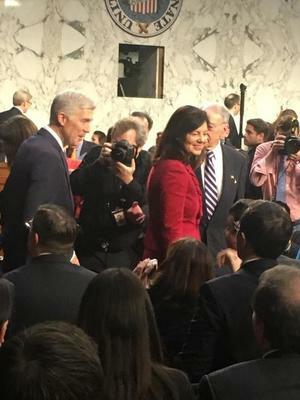 Gorsuch will be sworn in at the end of the hearing day. And he will be questioned tomorrow. Gorsuch is entering the hearing room. He comes in on the Republican side, greeted by various Senators. now with him. The room is filled with the whir of cameras. Various members of the Administration staff involved in the confirmation are here too, including Greg Katsas. Something like 52,000 pictures have been taken. The room is just now filled with laughter at all of it. Grassley has gaveled the hearing room in. As the hearing opens, the Supreme Court is conducting its normal business across the street. It should now be hearing arguments in its second case of the day, Howell v. Howell. The first case was Murr v. Wisconsin. 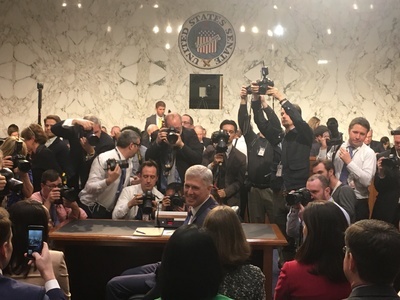 Gorsuch "Senator, this is quite a lot different from the last time I was here"
The last time the court was in session during a confirmation hearing was for Samuel Alito's hearing in 2006. In 2010, however, Elena Kagan's confirmation began just an hour or so after the Supreme Court concluded its term in late June. That was the last formal day of service for Justice John Paul Stevens, who had announced his retirement a couple of months earlier (which was why the Kagan hearing was ready to go). It was also poignant that 2010 day because Justice Ruth Bader Ginsburg's husband, Martin, had died the night before, yet Ginsburg took the bench and delivered an opinion. Sen. Grassley is presiding over his first Supreme Court confirmation hearing. He became chairman when the Republicans regained control of the Senate after the 2014 elections. Sen. Orrin Hatch, Republican of Utah, actually has greater seniority than Grassley, but he is chairman of the Senate Finance Committee. udge Gorsuch is a reasonable, mainstream conservative"
Sen. Dianne Feinstein of California is serving as ranking Democrat for for the first time in a Supreme Court confirmation hearing. Sen. Patrick Leahy of Vermont has greater seniority, but he gave up the ranking member slot on the Judiciary Committee because of some of his other committee assignments. The first changeover of general public seats is happening now. 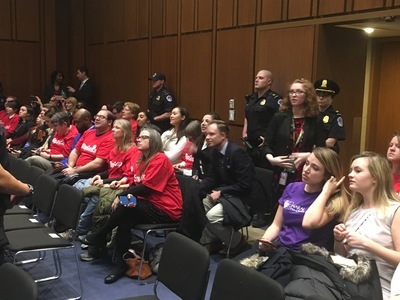 Several people wearing red T-shirts that say "#StopGorsuch" have just left, though a few remain as part of another group of the general public. There are also several spectators with purple T-shirts from NARAL Pro-Choice America.